Contact a Prosthetic & Orthotic specialist today! One out of every 300 live births results in a baby born with the plagiocephaly –torticollis deformation sequence. Positional plagiocephaly is characterized by: flattening of one side of the occiput, forward progression of the ear on the same side, and bossing of the ipsilateral forehead. For those infants who do not make progress with therapy or positioning by three months of age, the prescription of a custom orthosis is recommended. At Boston Brace, we manufacture a cranial remolding helmet known as the Boston Band. We utilize a unique layering technique for our helmets, which gives the Orthotist the ability to remove layers whenever necessary, thereby allowing the infants head to grow in a normal fashion. 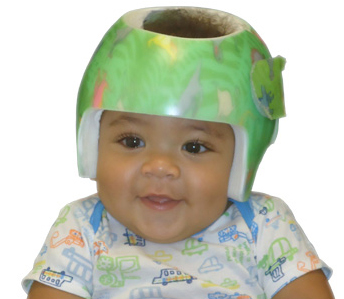 The treatment of plagiocephaly with a cranial remolding orthosis should commence at approximately 3 months of age. The Boston Band is a lightweight, plastic and foam orthosis made from a cast impression or a 3-D scan of the infants head. It is made of a plastic flexible shell lined with polyethylene foam. The foam can be modified over time to allow for growth and will provide a pathway for the infant’s head to grow into a more symmetrical shape. The Boston Band allows the baby to sleep in any position he or she wants, yet keeps pressure off the flat spots and constrains head growth along the axis of the prominent parts. It offers a simple and direct solution to the problem of positional plagiocephaly and brachycephaly. Correction usually occurs within 2 to 3 months for patients beginning Boston Band treatment at 3 months of age. In older patients, longer treatment time may be necessary. If treatment continues past 10 weeks, follow up appointments will take place every 4 weeks until termination of the treatment. The final scan will take place during the final appointment. Advances in scanning technology have provided Orthotists with the ability to replace plaster casting as a method of acquiring accurate molding of the infant’s head. A primary benefit of this method is highly accurate and repeatable imaging process that allows for detailed evaluation and tracking of symmetry and shape over time, with periodic scans. Another consideration is the significant improvement in patient comfort, as plaster casting can be an emotional process for some infants. Benefits in fabrication have also been realized with the quick transfer of data and improved design accuracy, to 1/100 of a millimeter. Boston Brace continues to be the leading provider for Orthotic bracing. Boston Brace maintains a network of educational support with several patient care clinics located in world-class medical facilities, including Children’s Hospitals of Boston and Philadelphia. Working closely with such diverse and progressive educational institutions, has offered Boston Brace the opportunity to continuously test, streamline, and improve the products and processes for its customers and patients. Specializing in pediatric Orthotic management, we continue to drive advancements in technology for the management of Scoliosis, Plagiocephaly, and various neuromuscular disorders. All locations are American Board Certified (ABC).